Bespoke villas designed by architects offering modern architectural styling, open plan layouts, natural light and large terraces with infinity pools overlooking the Mediterranean sea and the beautiful countryside. 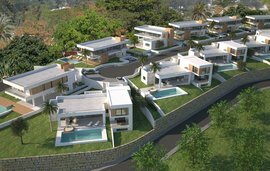 Outstanding modern villas that answer the need for quality contemporary properties in an appealing Marbella location that offers peace, privacy and security yet is close to everything this region has to offer. The easygoing outdoor lifestyle that makes Marbella so sought after across Europe, and the villas on this new development offer a very contemporary way of enjoying this way of life. In catering to todays homeowner, they feature not only sophisticated modern architectural styling but also open plan lay-outs that allow for flexible, appealing interior living spaces. Stylish and rich in natural light, the rooms and terraces are designed to make the most of the stunning views that surround your property, with creative design meeting the finest materials, construction standards and the latest technology to create luxurious modern homes for the 21t century. A choice of three main designs and three sub designs are available to complement personalized kitchens, bathrooms and overall decorative fittings, with additional space available to create a spa, home cinema, entertainment area or gym. Private garages, landscaped gardens and spacious terraced areas and pool decks complete villas designed for enjoying the Marbella life in style. Within La Alquería itself are a supermarket and a first class bilingual international school, with golf courses, shops, restaurants and beaches at your fingertips. This is an area of racquet clubs, spas and boutiques but also of rambling through nature and exploring the charm and gastronomy of ancient little villages like Benahavís. -Full landscaped garden including lighting. -Linear air conditioning vents downstairs.